Running the program starts with a voice introduction by what sounds like a forties American newsreporter. He leaves you in a rendered newsroom office to roam. You can move to different parts of the chronicle by clicking on the different objects in the room, or by navigating through the control bar accessed from the button in the top left hand part of the screen. The navigation bar has icons for the newsroom, news screen selector, calendar, biographies, 20th Century in focus, searches, chronicle online, print/copy article, options, random tour, help and quit. Objects in the room can access these areas; for instance, clicking on the television goes to the video archive. It may be more fun, but can take longer to get to the information you want. 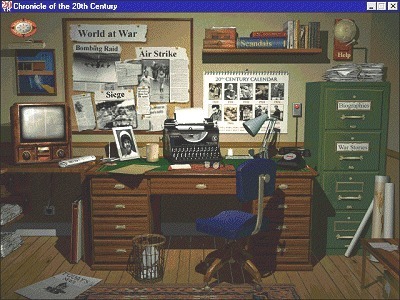 To find out about some war stories, you have to click on the filing cabinet, then click on the models of the warplanes to get to the section. You can rotate around the room, to see the other walls, which have more objects to click on, but it's quicker to use the navigation bar. The news screen selector shows the main story, with a picture or a video clip. The next story going backwards or forwards is shown in the news review bar at the bottom with a new extra box on the right. This shows several extra items of interest, which appear in a pop up window on the screen when you choose one. 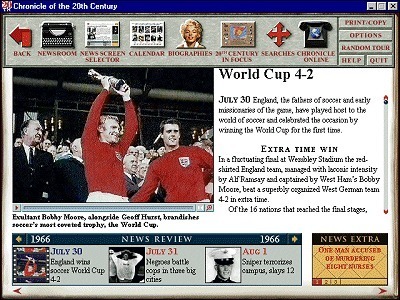 In the top right hand side of the screen is the news in brief button, which lists events for every day in the century. Some of these hyperlinks point to the main stories. It covers all dates up to July 1996. The calendar shows tens years on a page at once, with one picture showing a story from that year. Clicking on the selection from the bottom takes you to another ten year selection, whilst clicking on a picture shows the headline of the story before it loads into the newsroom page. The biography section lists one hundred personalities alphabetically, with a photograph. Clicking on the portrait takes you a detailed biography, with sound clips. The one on Elvis Presley has him taking about why he can't keep still when he sings! Other people featured include Charles De Gaulle, Eva Peron and Pablo Picasso. The 20th century in focus centres on eight subjects, namely World War I, Russian Revolution, Europe of the Dictators, America Between the Wars, World War II, Space Exploration, The Vietnam War and the Fall Of Communism. Each of these tour subjects is covered in depth, with an overview of the subject in a video clip and text, and headings shown on the left of the screen. Each heading has items shown on the right hand part of the screen, which could be text, sound clips or video clips. There are a total of 70 avi files (339Mb), 367 wav files (41Mb), and 4631 PNG files (106Mb) on the disc. The Portable Network Graphics format is similar to the GIF format, but can save files with more than 256 colours. Picture quality remains high while file size stays low, and although not supported by many programs so far, it will become a popular format, especially for web sites as well as multimedia programs. Searching the disc is possible through the Chronicle Finder, which allows you the search by word, date or media type. You can search 'On This Day' to see different events through the century, or use the day search to find information on one day in history. In fact, you can find any period using the time line, and then see the news of that time. Chronicle Online is the web site with extra features to keep you up to date. The leaflet that comes with the program gives you a list of requirements, which are pretty basic: a multimedia computer, a modem, an Internet Service Provider and a web browser. The site is password protected, but your username and password are given to you in the leaflet. It is divided into: Today in History (latest world news and events), Back Issue (news items from newspapers throughout the century), Biography (an up to date version of the one on the disc), Time Gallery (objects that were once part of everyday life), Design Classics (designs through the century), The Closet (fashion history), People's Chronicle (users' experiences over the century) and Out of The Attic (users' objects with interesting stories). All of this information is free, but only to people who have the disc (due to the username and password). The one feature that is notably absent is the back button. Once you start moving from story to story, you cannot back trace your steps. The back button on the navigation bar just takes you back to the story you were looking at without the bar on top. There is a vast amount of information in the Chronicle, but not in great depth. There is a variety of ways of accessing the information, and the online feature does not update the information, but rather supplements it. As always with Dorling Kindersley the presentation is excellent, and only the problems with the installation flawed my views of the program. The program does not seem too biased towards American events, which I'm sure it would if Microsoft made it. This is an easy reference guide that would provide a good starting point for any school project, but it may not have enough information on it's own to provide a full story. Alternatives: Daily Mail Centenary (£21.99), Makers of the 20th Century from New Multimedia (£26.99).